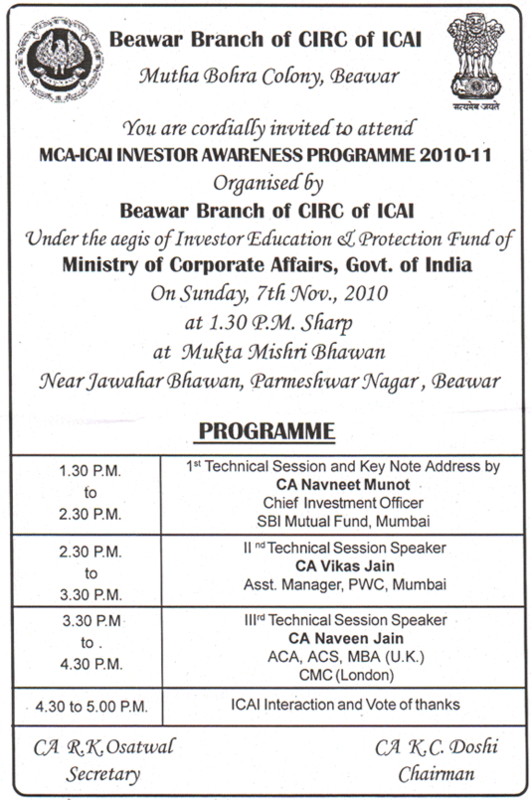 We are pleased to inform you that Beawar Branch is going to organise Investor Awareness Programme under the aegis of Investor Education & Protection Fund of Ministry of Corporate Affairs, Government of India on 07.11.2010, Sunday at 1.30 pm at Mukta Mishri Bhawan, Beawar. Formal invitation card containing the details of the programme is attached herewith. We are happy to inform that in this programme the CA Navneet Munot, Chief Investment Officer of SBI Mutual Fund, CA Vikas Jain, AM, PwC & CA Naveen Jain, ACA, ACS, MBA(UK), CMC(Landon) will deliver their talk on various subjects related to capital market & investor awareness. As the programme is unique one and for the first time arranged at Beawar, you are requested please to kindly grace the programme. CPE credit of 2 Hours* is given for the programme.